Compared to Fox, Falco’s amiibo is a direct upgrade on nearly all fronts – that is to say, you will likely have more success training a Falco amiibo than a Fox amiibo. Falco has better AI and a stronger skill set. His smash attacks are powerful and have decent range: his forward and up smashes serve as particularly potent KO moves. Falco’s recovery is also better than Fox’s. His up special travels farther, and his jumps are higher. 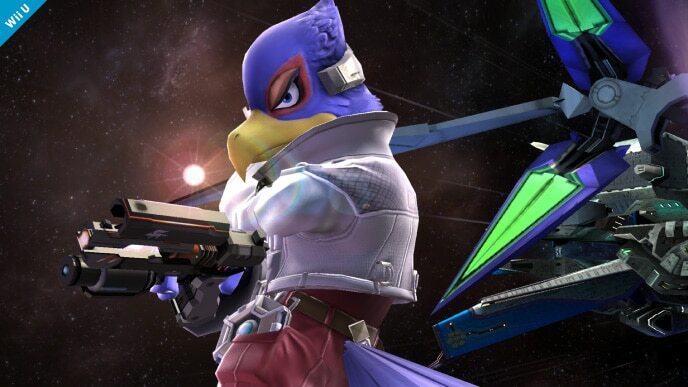 Falco also has a solid set of tilts as well as a useful infinite jab that can help him rack up damage fast. However, Falco is not without his flaws. His AI, while undeniably stronger than Fox’s, has its own glaring issues. It may overuse its neutral special, side special, and especially its forward aerial. 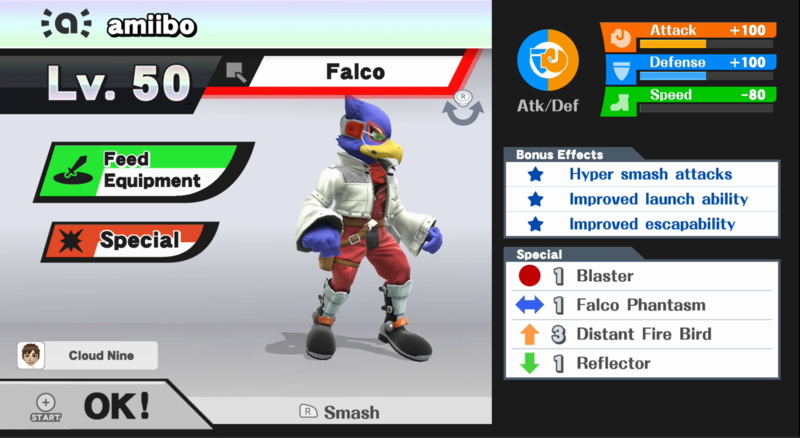 Falco is also a lightweight character, meaning that his in-game durability is rather lacking. Overall, Falco is a decent contender. It will take some time to hone his skills, but with enough match experience, he can completely outshine his opponents. Burst Blaster: Functions similarly to Fox’s Blaster. Compared to the default version of the move, Burst Blaster fires faster, but has decreased power and range. Distant Fire Bird: Falco charges up for a bit longer, but will travel farther in return. It is a superior recovery move that is more useful than its default version. Neutral options: jab, forward tilt, up tilt, and down tilt. 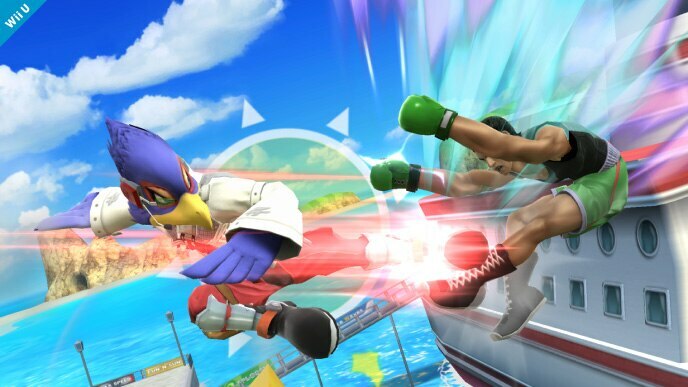 Falco’s jab and tilts are best used at lower percentages. Each one is quick and inflicts respectable damage. Forward tilt and down tilt are best against grounded opponents, while up tilt can be used as a light aerial punish. With good timing, it can also juggle foes. Main KO moves: forward smash and up smash. 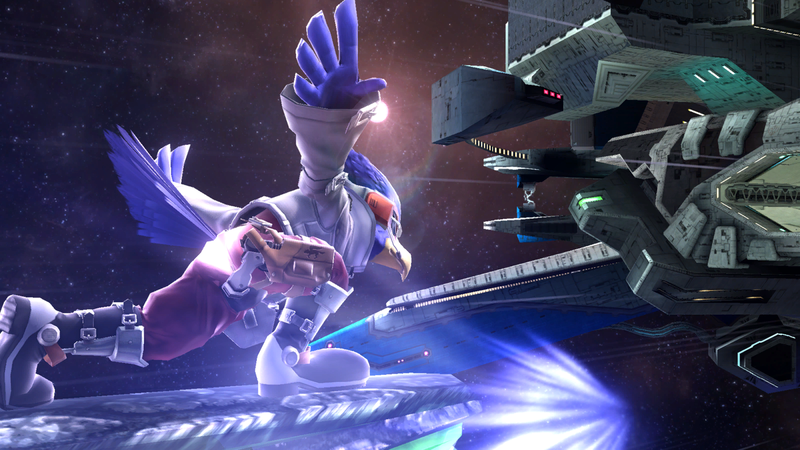 Falco has two solid KO moves – his forward and up smashes. Forward smash has deceptive range due to moving Falco forward, and is the strongest move in his arsenal. Up smash is slightly faster, but is not quite as strong. Moves to avoid: down smash, neutral special, side special, and up special. Fox amiibo overuse their down smash – and Falco amiibo may get into this habit if left unchecked. Avoid down smash at all costs. Burst Blaster does not bring Falco much benefit, and is still somewhat laggy even with its increased speed. Falco Phantasm and Distant Fire Bird should be used for recovery purposes only. Thanks to Blue for compiling Falco’s information. Images are courtesy of SmashWiki and the official Super Smash Bros. website.